With the right tools, cutting through metal is easy. With the wrong tools, it’s not. As a much harder substance than other building materials like wood, the process of cutting metal can be a challenging, slow-going process that damages blades and generates a lot of heat. 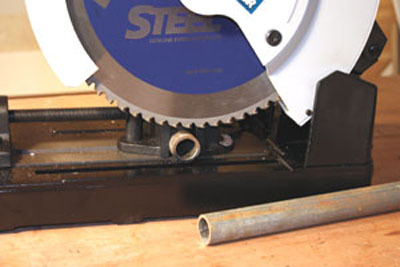 Cutting sheet-metal can often be accomplished with simple hand tools. Straight cutters, which are scissor-like hand tools, are used to make straight or gently sloping curves. Some metal snips are designed especially for cutting right- or left-hand curves—a handy design for cutting circles in metal. Standard electric shears use metal-cutting teeth to make fast, straight cuts through sheet metal. But what about the thicker, harder metals? Grinding is the most common way to cut hardened steel. The abrasive action of the grinding wheel removes metal material at a rapid pace, but it also generates a lot of heat. This heat can at times cause the grinding wheel to break, sending debris flying dangerously around the worksite. And, if your grinding wheel is glazed or clogged, it has no “bite” and you’ll only generate heat without cutting. This article focuses on a handful of metal-cutting power tools that are designed specifically to accomplish such metal-cutting applications in a safe and productive manner. Evolution Power Tools is a company based in the U.K. that manufactures a range of specialized power tools dedicated to the steel industry. These heavy-duty industrial tools are suitable for sustained daily use, and feature an innovative dry-cutting technology that minimizes heat buildup and dramatically reduces blade wear. The dry cut metal-cutting technology is achieved with a heavy-duty motor that runs at a lower RPM with higher torque, when compared to wood-cutting saws and abrasive cutting saws. The Evolution system uses specialty carbide-tipped circular saw blades to cut materials such as steel, aluminum and stainless steel. The EVO380 Raptor from Evolution Power Tools is engineered with a heavy-duty motor that runs at a lower RPM and higher torque than conventional chop saws for exceptional metal-cutting performance. The EHT staff had the opportunity to test some of the Evolution saws, starting with the 15-inch EVO380 Raptor Steel Cutting Chop Saw. With a 15-inch tungsten carbide-tipped (TCT) blade, this industrial-grade chop saw quickly and easily penetrates steel without heat, burrs or coolant, leaving a smooth, clean cut. The cutting capacity is remarkable as well, with a 4-3/4-by-4-3/4-inch box section with a 1/4-inch wall thickness—big enough for a steel beam. According to the manufacturer, the blade averages 1,000 cuts in 2-by-2-inch mild steel with a wall thickness of 1/8 inch. That’s a lot of cutting on a single blade. Our staff didn’t have the time on hand to run the saw for 1,000 cuts, but we put it through the ringer cutting iron pipes, rebar, metal posts, aluminum gutters and a few oddball items we had laying around the workshop. The bottom line: The saw never so much as flinched, much less struggled. Just as the manufacturer professes, the cutting action is much quicker and cleaner than with abrasive cut-off saws, hands down. An accessory work-stabilizer attachment helps the Raptor hold all sorts of shapes for cutting. 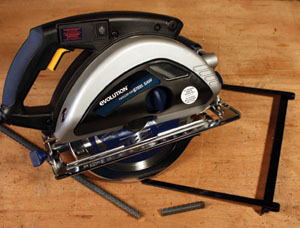 Although the saw’s price point combined with its specificity of application would probably qualify the EVO380 Raptor as overkill for the average DIY’er, there are plenty of professional metal workers, “extreme” hobbyists and serious tool hounds for which this saw would prove to be a great investment. The 9″ Evolution Steel saw comes with a heavy-duty carrying case, a rip fence and offers a cutting depth of 3-5/16 inches. 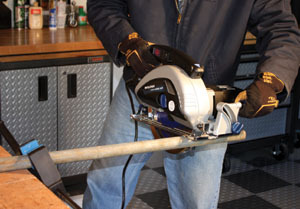 A high-capacity chop saw, by its very nature of design, is a large, heavy and cumbersome tool to tote around a jobsite and often impractical for certain chores, such as cutting material in place on hard-to-access jobsites. To that end, Evolution offers a couple of handheld TCT circular saws that utilize the same dry-cut technology as the Raptor, a 7-inch and a 9-inch version. 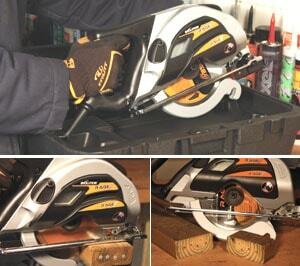 The Rage multipurpose saw cuts wood, steel and aluminum with the same blade. The EHT staff kicked around the 9-inch version and loved it. This saw features the same metal-cutting technology as the chop saw, but this time it’s served up “on the go.” We had so much fun slicing through metal posts, pipe and even a few discarded chair legs that we had to fight the temptation to cut through stuff that we actually needed. The saw weighs nearly 20 pounds, which isn’t the lightest in the world but it is easily maneuverable for anyone who is accustomed to working with circ saws. The 1,750-watt motor easily pushes the blade through mild steel without heat buildup, burrs or coolant—just like the Raptor. The saw also features a laser guide to assist with accurate cutting and a bevel-tilt feature for cutting at an angle. 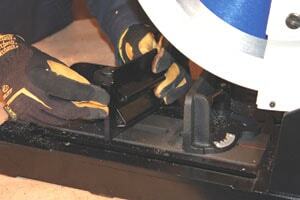 The saw cuts up to 1/2-inch plate thickness, and the maximum cutting depth is 3-5/16 inches. According to the manufacturer, one of the 9-inch blades cuts up to 87-1/2 yards of 1/4-inch steel plate. Although the Evolution blades are designed for Evolution Steel cutting saws, they can also be fitted to other brands. Evolution offers blades in a number of popular sizes, and four different types of blades are available; steel, stainless steel, aluminum and wood. 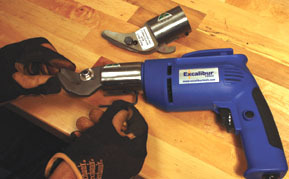 The Excalibur Combo Cutter can cut cement board or sheet metal–just swap the cutting head. Running with the metal-cutting concept, Evolution also offers a line of multipurpose saws targeted to general construction work. 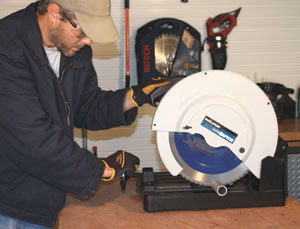 The Evolution Rage line of multipurpose saws includes a chop saw, a miter saw and a handheld circular saw. The Rage multipurpose saws are engineered to compete with professional quality wood-cutting circ saws while offering the added ability to cut materials that simply aren’t possible with other saws. The combination of a high-torque motor and gearbox and an ultra high-grade TCT blade enables these saws to cut wood, steel and aluminum using the same blade. The EHT staff had the opportunity to test the handheld Rage 7-1/4-inch multipurpose saw, and it works just as advertised, slicing through some scrap steel and an aluminum door frame with no sparks and minimal burrs. We recreated a typical jobsite scenario by driving nails into the end of a 2-by-4. If you’ve ever run a standard circ saw into an unseen nail, you know to expect a violent and often dangerous kickback when the blade hits. This is not the case with the Rage saw, which coasted through four 16d nails with no recoil whatsoever. And, according to the manufacturer, a single blade can cut up to 164 feet of 1/4-inch mild steel before requiring replacement. Each of Evolution’s handheld circ saws, in both the steel-cutting and the multipurpose Rage line, come complete with heavy-duty carrying cases for easy portability. Regular readers may have seen our staff cover the Excalibur Combo Cutter in a past article on installing a tile countertop. To speed up the process of cutting cement board, the Excalibur’s powered shears achieves a straight, dust-free cut with no ragged edges. 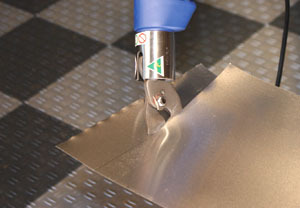 It’s the most accurate cement-board cutting tool we’ve ever used. I mention this in an article on metal-cutting tools because that same tool serves as an excellent sheet metal shear. The Excalibur easily cuts steel up to 16 guage. By swapping the interchangeable cutting head, which is as simple as using the provided hex key to loosen two set screws, the Excalibur shears can make straight or curve cuts in steel up to 16 gauge, stainless to 18 gauge, corrugated roofing, and aluminum up to 0.080 inch thick. The Excalibur combo kit includes both cutting heads, and the tool features a powerful 120-volt, 600-watt motor. Easy maneuverability is another key feature, because the cutting heads can be rotated to anywhere in 360 degrees for the most comfortable position for cutting. The 16″ Milwaukee Compact Bandsaw is ideal for cutting metal in tight spaces. For tough cut-off jobs that require workers to cut metal in place, Milwaukee Electric Tool’s new 6242-6N Compact Band Saw is an ideal tool for cutting metal overhead or in tight spaces. With an easily manageable weight of only 9-1/2 pounds and a maneuverable length of just 16 inches, the saw is easy to use with minimal user fatigue. With a 3-1/4-inch cut capacity and low vibration, the saw achieves a super-clean cut on a wide variety of construction materials, such as 3-inch angle iron, 2-1/2-inch conduit, 3-inch copper and threaded rod. For dimly lit work spaces in confined areas, the saw also features a handy work light that illuminates the point of blade contact. The saw includes a 200- to 360-SFPM variable speed dial, a 120-volt, 7-amp motor, a blade ejection system for easy changes, and an adjustable material guide so the user can make cuts flush with the ceiling or walls. The saw comes with a durable carrying case for easy toting to the jobsite. With the right blades, saws that cut with reciprocating action like jigsaws and Sawzalls can effectively cut metal in a wide range of applications. For Sawzall-type recip saws, Bosch offers the new Micro-Edge Technology with its Edge Metal Cutting Blades, a patented design process that results in longer blade life, and faster cutting with teeth that stay sharper over time. 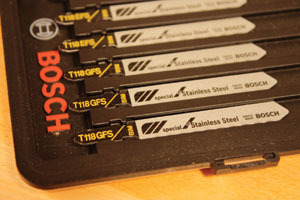 Our staff actually tested these blades at the Bosch headquarters outside of Chicago. The powder metal steel alloy in the blades reduces heat buildup, a big factor in blade deterioration, and the 2-by-2 tooth geometry removes debris for fast and clean cuts. The first set of teeth cut more aggressively, and then the smaller reinforced teeth follow. This alternating tooth pitch boosts cutting speeds by 20 percent. Jigsaws are also excellent tools for making small or intricate cuts in metal, thanks to the saws’ inherent maneuverability and the small size of the blade. It helps to choose the right blade to match the application. Available are blades specially designed for aluminum, others are intended for general metal cutting, and some metal-cutting blades are engineered with extra flexibility to reduce the likelihood the blade will break. For cutting stainless steel, Bosch offers the T118GFS bi-metal blades for twice the life in such difficult specialty applications. The new bi-metal blades feature an 8- percent cobalt steel additive to increase heat and wear resistance. This gives users a blade that lasts twice as long as most other bi-metal blades and costs much less than blades with a carbide tip. No matter what the tool you’re using or what job you’re performing, remember that safety should reign supreme when cutting metal. The process is tough on blades, typically generates lots of heat, and there is the risk of breakage from the blades or the stock material, which can lead to flying debris. Never force the tool, and always wear hand and eye protection. When cutting at long intervals, it’s also wise to wear hearing protection, and always avoid working around flammable materials when producing sparks.